Each dog owner will decide for themselves what kind of dental care they want to provide for their dogs. However, before you decide that toothbrushes are only for humans, read the following five reasons on why it may be a good idea to reconsider your dog’s daily dental care routine. Dogs having bad breath is hardly unheard of. But what most people don’t know is that a stinky breath can be a symptom of dental, lung, or gastrointestinal issues. If your dog’s breath suddenly smells different, sweet, or exceptionally bad, contact your veterinarian. Regular mouth and breath check-ups should be part of you taking care of your dog’s overall well-being. Brushing your dog’s teeth regularly (Aptus Bucadog), preferably every day, can help to prevent dental health problems and bad breath. Periodontal disease is an inflammation in the tissue surrounding a dog’s teeth, more specifically the gums, periodontal ligament and alveolar bone. It affects the deep supportive structures of the teeth and is one of the most common diseases dogs suffer from as of today. Minerals in the saliva together with food remains and bacteria in the mouth will form plaque, which can lead to an inflammatory condition called gingivitis. The best way to prevent this condition is to take good care of your dog’s teeth by brushing daily. Keep an eye out for plaque and check your dog’s teeth for signs of early tooth decay. These regular check-ups can be performed at home and they should happen approximately once a week. A thorough check-up by once a year, performed by a veterinarian, is always recommended even if you brush your dog’s teeth daily. In your weekly check-ups, look out for soreness, bleeding, lumps, fractured teeth, or growths on the gums. If you do find something irregular in your dog’s mouth, always consult your veterinarian instead of trying to treat the issue at home. Dental care done wrong can cause a lot of unnecessary pain and damage to your dog’s teeth and gums. Inflammation in the dog’s mouth (commonly referred to as stomatitis or gingivitis) is a serious condition that requires veterinary care. The painful nature of this condition can cause your dog to avoid eating or drinking properly. Common symptoms include redness and swelling in the gums, which can be extremely painful for your dog. Other symptoms can include excessive drooling, mouth/tongue sores, disinterest in playing, eating and drinking, continuous pawing, fatigue, whining when trying to eat, and bad breath. In most cases, infections are caused by poor dental hygiene, so brushing your dog’s teeth can help to prevent these kinds of infections. However, the inflammation can also be caused by viruses, diabetes, thyroid disorder, or cancer so be sure to check with your veterinarian if you notice any of these behaviours. Tartar buildup on your dog’s teeth can lead to severe health issues. Tartar doesn’t take long to form and it can cause immediate damage to a dog’s teeth and gumline. It starts out as plaque, which begins to form a couple of hours after eating. When the plaque combines with the salts in the dog’s saliva, it builds up and hardens, turning into tartar. Tartar provides a perfect base for bacterial growth, which can lead to many different dental issues, and even to tooth root decay and tooth loss. It is important to keep checking your dog’s teeth and gum line at home, as well as with regular yearly veterinary checkups. In addition to brushing your dog’s teeth daily, it is a good idea to provide daily chewy toys as well as veterinarian approved dental treats (Aptus Bucadog Chew). Raw bones can also help prevent tartar buildup. Are you grossed out by now? Good. Taking care of your dog’s dental hygiene should be just as important as taking care of your own. 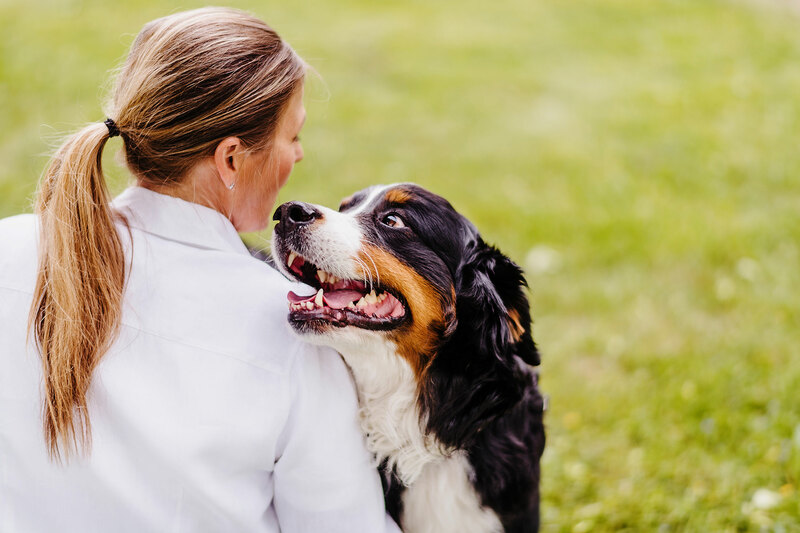 Once brushing and regular check-ups become a natural part of your daily and weekly routines, you won’t even notice the few minutes it takes to be a responsible dog owner.